We’ve got a billboard boot camp coming up in a week, and that’s always a very exciting time for me. I always enjoy meeting new people and teaching them about the industry. But what happens to the people who attend? I hear from many of them as they build or buy signs. My top student ever built a giant portfolio in Canada and then sold his interest. Others have built 10 or 20 great signs. Still others have found a location, obtained the permit, and flipped it to a bigger company. Of course, I don’t bug people, so unless they contact me later, I never know how their story turned out. But I really enjoy being a part of people’s entrance into the business. If you are interested in attending the Boot Camp in St. Louis, be sure and call us at (970) 856-4070, or email at [email protected]. Being an economics major in college, I am a big believer in supply and demand. And I have always like industries that have a legal blockage to infinite supply. In the case of billboards, that supply restriction is the U.S. government, which has controlled where billboards can go (and effectively, how many there can be) since the Highway Beautification Act in the 1960’s. Two other industries that have been controlled by the U.S. government are trucking and airlines. Of course, those two got de-regulated in a quest to lower the cost for the U.S. consumer (you may remember in the movie “The Aviator” that PanAm was trying to do anything to maintain its monopoly license with the government for international travel back in the day). Billboards have little risk of de-regulation, because there is no price competition rationale, and people hate the way billboards look. It would be hard to convince Scenic America and other public service groups that having billboards on every inch of highway would be a good thing. Billboards have never been a capital intensive business as a start-up. Most people get in the business either building wooden signs or flipping signs or buying abandoned signs – something reasonable. They later work up to monopoles and even entire company acquisitions – but they don’t have to start out that way. Look at Whiteco Outdoor. Whiteco started out with Dean White building little wooden billboards for predominantly Holiday Inn. Over time, Whiteco was a forerunner of monopoles. Later, they were acquired by Lamar. Dean White did not have a lot of money originally. Of course, his family had a ton after the Lamar sale! Every billboard is like a different stock. The location is a little different, the visibility is a little different. If you own 10 billboards, it’s like an investment portfolio with 10 different stocks in it. By comparison, when you own a McDonalds, you normally own just one restaurant. If that market declines (like Detroit), you’re toast. If the road in front of your store is shut down for a while to re-surface it, you’re in trouble. There is no substitute for diversity – that’s what gives you protection from the unknown. Billboards are perfectly suited for that type of balance. In tough economic times, you have to love being the cheapest. It works for Wal-Mart and it’s working for Dollar General and the Dollar Store. Advertisers are no different – they are looking for a deal. Billboards reach customers at less per head than any other media option. That’s why they’re so easy to lease. You can rent a billboard for a month for less than a one-time ad in the newspaper. Billboards rely on traffic to bring customers by them – and traffic is increasing daily. Americans like to drive, and they are huge consumers of cars. It’s unlikely that the American appetite for driving is ever going to change. On top of that, commute times are at an all-time high, averaging over 30 minutes each way (over an hour in some cities). This is all good news for billboards. The internet has destroyed most of the traditional media companies. People don’t buy newspapers, they look at the news for free on line. They don’t listen to radio, they listen to Youtube or their cell phone. They don’t watch TV, they watch streaming videos or Youtube, or maybe work on their Facebook page. The only form of advertising that is not subject to destruction by technology is billboards. Billboards don’t require content to make you look at them – you are stuck with them when you drive. Everyone knows what a billboard is. They know how it works. You don’t have to explain it to people. Think of all the new techonology items that you can’t even begin to understand how they work. Then try and sell those products to people – you have to spend forever explaining to them why they would even want that product. Imagine how hard it was to sell fax machines when they first come out. Billboards are easy – you don’t have to explain anything to anybody. You just say “billboard” and they think “billboard”. Newspapers have to sell advertising space daily. Television and radio have to sell advertising time by the minute. Billboards are by the month and, even then, normally on a 6 month or 12 month commitment. So you only have to do a fraction of the work to make the same money. On top of that, advertising renewal rates are extremely high – people sometimes stay on the same sign for 20 years or more. Some things are really hard to sell if you need to. Like raw land. It makes no money and is only attractive to speculators – and it can sometimes be years between transactions, even decades. Billboards are income producing and there are billboard companies in just about every city in the U.S. I have never had a problem selling a billboard when I wanted to sell it. I just let the other billboard companies know, and a few weeks later it was sold. This could have been reason #1 – but I wanted you to read the other reasons, too. If I had this as reason #1, you’d just gloss over the rest of the article. But it’s a fact, you can make a lot of money with billboards, in relation to the amount of time and money they cost to build and operate. More than any other form of media. 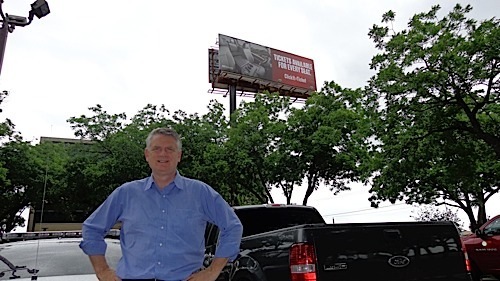 I got into the billboard business on a whim – but stayed in it for a bunch of reasons. I think each of these reasons will only get better in the years ahead. 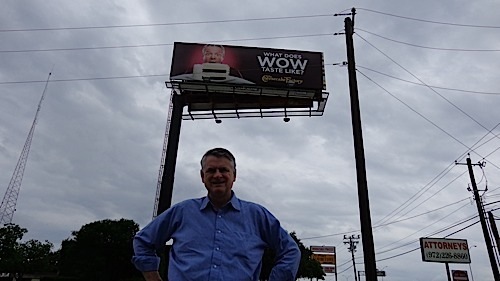 On a recent trip to Dallas, I decided to visit the first and second billboards I ever built. On all my marketing materials and inventories, these signs were proudly shown as sign #1 and sign #2. They are both on Interstate 30E in Garland, Texas – just east of Dallas. 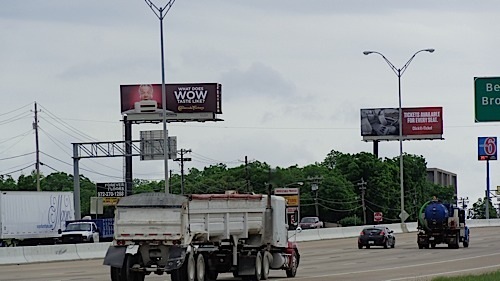 Sign #1 is a 20’ x 60’ billboard with 2 faces and is 120’ tall – the tallest billboard in the Dallas/Ft. Worth Metroplex at that time (and probably still is). Sign #2 is just down the street, and is a double-sided 14’ x 48’, about 77’ tall. While the property under sign #1 has changed hands several times, the landowner on sign #2 is still the same after all these years. Although sign #2 is not nearly as tall as sign #1, it is still probably the second tallest billboard on Interstate 30E. Here’s a photo of the two together, as seen to west-bound traffic. You will note that they appear basically the same size in the photo, even though sign #1 is 500’ farther away than sign #2. That’s because the 20’ x 60’ face size is so large. You don’t really appreciate the size of sign #1 until you get right up on it – and then it’s a beast. However, I should have probably built sign #1 to the same specs as sign #2, because it cost 50% less and the difference in rent is negligible. When I built sign #1, I got caught up in the trivia that it would be the tallest sign in Dallas. Of course, nobody cared except me! Back when I owned the billboard operation in Los Angeles, one of my most famous signs was at the corner of Wilshire at LaBrea (next to the Asahi Beer Building). This sign had been around since the 1930’s and had been featured in many movies, most recently having a cameo appearance in the movie “Falling Down” starring Michael Douglas. It was the one billboard that I really regretted selling, because I’m a big history buff. I also figured it would last forever, as it was on top of an office building. Unbelievably, that’s the only Los Angeles billboard I owned that no longer exists. The office building was torn down to build a new Taco Bell, and the billboard went with it. Imagine if you had invested hundreds of thousands of dollars in that one sign – which appeared to be permanent – and then lost it to a Taco Bell. The moral is that you can never predict the future and, as a result, should never put all your eggs in one billboard basket. How to find billboard locations in small, medium and large towns and cities. 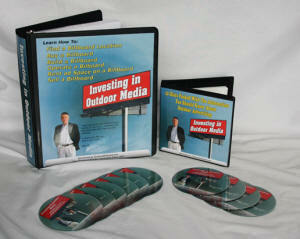 10 “outside the box” ways to find billboard locations almost everywhere. The right way to approach a landowner. How to determine the correct size and location for the sign. 10 ways to always find an advertiser – even in the recession. How to properly service your customers. The steps to flip leases and permits for immediate cash flow. How to build an operation that you can sell down the road.